News out of Germany is that the smart brand has plans to roll out its first crossover in 2016. The company hasn’t confirmed or denied the rumors being reported by Auto Motor Sport. 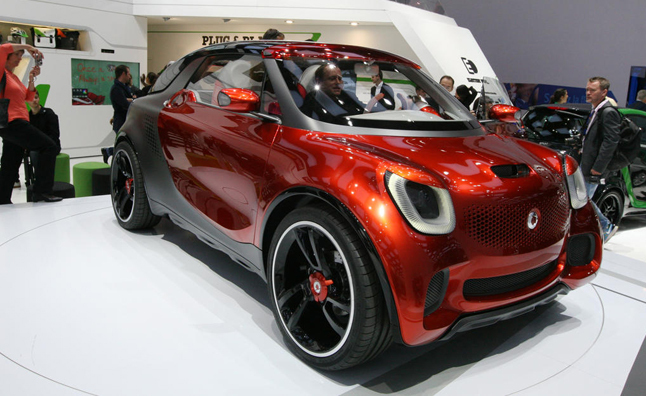 But there’s been speculation that smart has had a production model of a crossover in the works for years. An official concept model is reportedly set to debut next year. The idea makes a lot of sense considering consumer demands and the growing number of crossovers now being offered in the segment. We can only speculate whether the smart crossover will be a four-door model or two-door model. But a four-door seems more logical considering the key consumer selling point would likely be more space, which you wouldn’t necessarily get in a two-door smart crossover. Even Fiat now has a four-door version of the Italian sub-compact in its stable called the 500L. However, the German-based Daimler AG that manufactures the smart vehicles could launch both a four door and a sportier two-door crossover model like the Mini brand to appeal to different consumers in the segment. Either way, they’ll need to really rethink their marketing strategy if they have any plans of bringing the vehicle to the U.S. After roaring out of the gate in 2008 with a waiting list for the smart fortwo, the appeal of the brand seems to have died down. Although smart reportedly had an increase in sales last year, the carmaker has struggled to meet its initial expectations in the U.S. market. And just rolling out a “smart forfour” won’t be enough to lure in consumers. However, that 122 city mpg rated for the two-door smart EV is sounding pretty nice right now with how gas prices are fluctuating − even if you are limited to only one other passenger.